Ford has announced it is teaming up with Amazon to integrate Alexa virtual assistant into its cars, allowing vehicle owners to access shop, search, and control smart home features on the road. 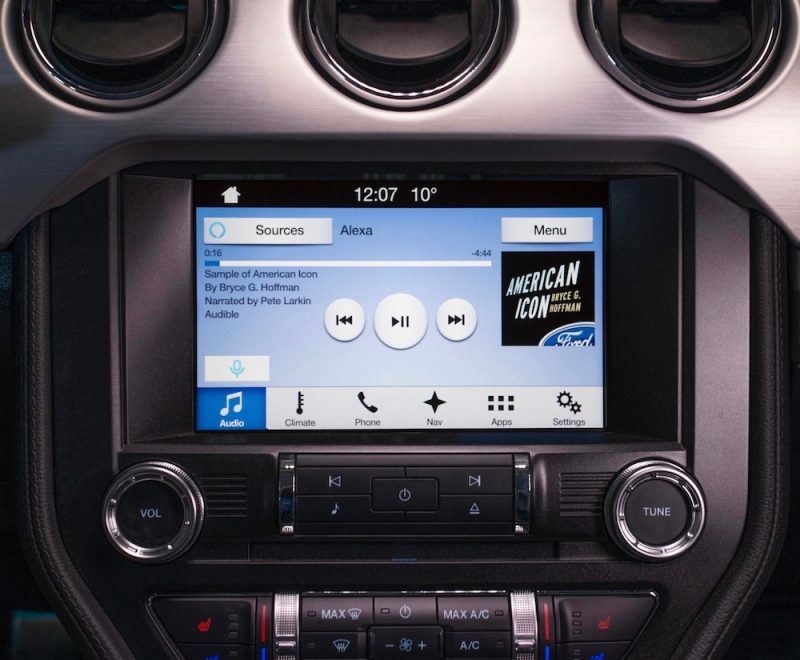 The partnership means owners of Ford cars equipped with the SYNC 3 AppLink system will be able to access Amazon's Alexa voice-activated virtual assistant from the driver's seat, enabling them to check the weather, add items to shopping lists, play audiobooks, and control Alexa-compatible smart home devices, like lights and thermostats. "Ford and Amazon are aligned around a vision that your voice should be the primary way to interface with your favorite devices and services," said Don Butler, executive director, Ford Connected Vehicle and Services. "Customers will be able to start their vehicles from home, and manage smart home features while on the road – making life easier." Ford said that beginning next month, some owners of its vehicles will be able to use Alexa voice commands to access certain car functions and even check the range of their car. Specifically, owners of the Ford Focus Electric, Fusion Energy, and the C-MAX Energy will be able to use their Amazon Echo or Echo Dot smart speaker in the home to lock their car or start the engine remotely. Ford said it plans to offer the Alexa commands in more of its SYNC Connect cars at a later date. The second phase of the rollout, expected this summer, allows Ford owners to tap into a broad set of Alexa skills using their voice while driving – helping them keep their eyes on the road and hands on the wheel. "We're excited to work with Ford to enhance the driver experience both inside and outside of the vehicle," said Steve Rabuchin, vice president, Amazon Alexa. "We believe voice is the future, and this is particularly true in cars. The ability to use your voice to control your smart home, access entertainment, manage to-do lists and more makes for an extraordinary driving experience. We can’t wait for Ford customers to try this out." Amazon's Alexa has been cropping up in a range of upcoming products at CES so far this year, appearing in third-party smart speakers, TVs, lamps, and even refrigerators. And you kill everyone on the road while you play with the screen. You understand that Alexa's only interface is voice, right? This is huge for Amazon. Aside from Apple CarPlay and Android play, now the echo is making its way from the home into the vehicle. And it's another bridge for Alexa to control various functions inside the car. And Alexa is proprietary to Amazon, which I'm curious to see how that would expand into other vehicles aside from Ford testing it. Meanwhile Ford is outspoken opponent of CarPlay and GoogleAuto to the effect it even established, with Toyota, an industry consortium against these interfaces. Their fear is either would become so popular as to reduce manufacturer's ability to design interfaces (as-if car makers were actually good at that ever). So I'm wondering what does Ford think will happen by introducing Amazon's Alexa into it's cars? That aside, Amazon has been hustling Alexa to perfection. This was a breakout season for it. Tim Cook ought to be worried. If Apple doesn't come up with a dedicated hub and promote Homekit more it may very well pigeon hole all of those subscription services he's been positioning as the future of Apple. Instead of Amazon putting its apps on iOS devices, the future may be Apple looking for entrance into Alexa devices. That isn't really true. Neither Carplay or Android Auto actually run natively on a single car. This new open source software isn't pushing them away. They will still be available from these car manufacturers. But the manufacturers are making sure CarPlay and Android Auto don't become built-in as the only option. To me, this is a good thing for consumers, not a bad thing. I don't want a car in the future that only works with Android Auto or Carplay. This is huge for Amazon. Aside from Apple CarPlay and Android play, now [S]the echo[/S] Alexa is making its way from the home into the vehicle. And it's another bridge for Alexa to control various functions inside the car. And Alexa is proprietary to Amazon, which I'm curious to see how that would expand into other vehicles aside from Ford testing it. You're exactly right. This is huge for Amazon. But more than that, Amazon brilliantly positioned Alexa to jump over Apple and most surprisingly Google. Alexa isn't tied to any ecosystem, Amazon gives it away (or charges very, very reasonable fees), and they allow people to build it out. Not only allow, they encourage it: https://developer.amazon.com/alexa-skills-kit. Amazon also handles all of the heavy lifting on their servers. For voice control, looks like Alexa is going to be everywhere soon. I've been a computer forensic expert for more than 12 years, traveled the world to train law enforcement, spoken about it at countless conferences including MacWorld, helped to design industry-standard tools used by all major law enforcement in the US and around the world, but yes, I'm sure you're the expert here. Tell yourself everything is fine and your conversations aren't recorded, if it makes you feel better. Post the evidence you have that the Echo is recording my conversations before the wake word. Nothing in that article contradicts what I have said. If it was always recording, which it isn't, surely you know with all your data forensic experience that they'd simply pull it off the device itself, which they have access to. Instead they're asking Amazon to give them the recordings... which also don't exist, unless the victim screamed out "Alexa, Colonel Mustard is killing me in the library with the candle stick!" And since you're such an expert with such worldly credentials, how's about a LinkedIn link? Indeed. In my car, none of the voice-activated gizmos work until I push the voice button on the steering wheel. Maybe because it doesn't do that at all and only listens for a trigger word locally? But ya know... facts. That is not how it works.